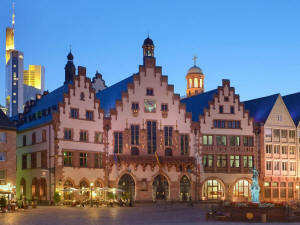 Upon arrival in Frankfurt, private transfer to your hotel (optional). Free time. of this great German poet (optional). Today you can choose between 2 tours that take you to romantic parts out of Frankfurt. Explore the vineyards, picturesque villages and castles on this Rhine River cruise along the beautiful Lorelei Valley named after the legendary golden-haired maiden whose songs caused the demise of mesmerized sailors. The valley is a UNESCO World Heritage Site. Admire the numerous medieval castles from the comfort of your boat. On your way back to Frankfurt we stop at the wine village of Rüdesheim, famous for its old town center and the narrow Drosselgasse Street with it historic half-timbered houses and wine taverns. Excursion to Heidelberg, the romantic Medieval town world famous for its beautiful vistas at the Northern part of the Black Forest area. Heidelberg hosts Germany’s oldest university and a popular destination overlooking the Neckar river valley. You will visit the historic center and the famous castle that houses one of the largest wine barrel reserves in the world. In the afternoon return to Frankfurt. After breakfast end of services or private optional transfer to the airport. City tour of Frankfurt (2hrs) Hop on and Off tur of Old and modern Frankfurt: You will be able to see the most important sights of the former Coronation city of the German Emperors and the modern Eropean Banking Center. The historic heart with the " Römer ", the famous old city hall, the Cathedral, and Paul´s Church., etc.